Physical Features: Varied soils ranging from black clay to waxy; level, draining to San Marcos River. Economy: Petroleum, varied manufacturing, government/services; part of Austin metro area, also near San Antonio. History: Tonkawa area. Part of the DeWitt colony, Anglo-Americans settled in the 1830s. Mexican migration increased after 1890. County created from Bastrop and Gonzales counties and organized in 1848; named for frontiersman Mathew Caldwell. Race/Ethnicity: (In percent) Anglo, 39.7; Black, 6.5; Hispanic, 52.3; Asian, 1.1; Other, 1.7; Two or more races, 1.8. Vital Statistics, annual: Births, 542; deaths, 320; marriages, 173; divorces, 102. Recreation: Fishing, state park, nature trails, museums, barbecue havens; Luling Watermelon Thump and Lockhart Chisholm Trail roundup in June. Agriculture: Eggs, beef cattle, hay, broilers. Market value $62.9 million. LOCKHART (13,543) county seat; agribusiness center, government/services, tourism, light manufacturing, prison; renowned barbecue at Kruez, Smitty's, Blacks. Luling (5,823) oil, tourism, agriculture; oil museum; hospital, barbecue cook-off in April. 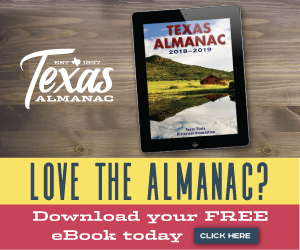 Other towns include: Dale (300); Fentress (380); Martindale (1,247); Maxwell (500); part of Mustang Ridge (941, mostly in Travis County), and Prairie Lea (320). Also, part of Niederwald (625), part of Uhland (1,331), and a small part of San Marcos (61,480), all mostly in Hays County. Luling has decorated oil well pumpjacks with cartoon characters like Snoopy. Photo by Robert Plocheck.